As the newly elected Mayor of Greater Manchester, I have made ending rough sleeping across the city region by 2020 one of my top Mayoral priorities. Within three years, and if we can achieve it earlier, no one should be forced to spend a night on the streets. As my first act as Mayor I am establishing the Greater Manchester Mayor's Homelessness Fund and as promised I will donate 15% of my Mayoral salary to kickstart the fund. I am delighted a number of local businesspeople have also already agreed to contribute. - Building specialised supported accommodation for young people with access to education, volunteering and employment opportunities. - Expanding mental health and rehabilitation programmes across Greater Manchester, including re-building community mental health support, recovery-led accommodation and arts programmes. - Bringing empty properties back in to use for people threatened with becoming homeless. 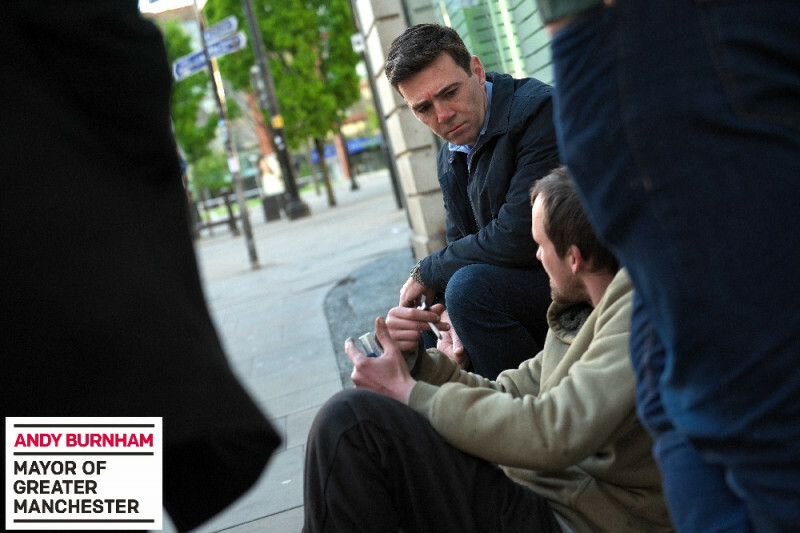 I am also creating a Greater Manchester Homelessness Action Network, to maintain this impetus, harnessing the goodwill and compassion of the people of Greater Manchester and beyond. This network will consist of charities, people who have experienced homelessness, businesses, faith groups, civil society and the region's local authorities, to share best practice, develop new solutions and progress in the same direction to tackle homelessness across Greater Manchester. So, I will provide leadership, but I need your help. As citizens, businesspeople, community organisations, you can help by donating a proportion of your salary, a one off amount or goods such as furniture (as required by local organisations). We are also keen to hear from people who can donate unused building space or organisations which have skills and expertise they wish to offer. You can contribute to the Mayor's Fund by donating here. For more information on the fund you can email GMHAN@greatermanchester-ca.gov.uk. Please note, we will not be able to facilitate the donation of items such as sleeping bags, tents and outdoor clothing. Distribution of resources will be decided by the fund's trustees, including people who have experienced homelessness in Greater Manchester, national homelessness experts and Ivan Lewis and Cllr Beth Knowles, who will co-chair the network and oversee the delivery of my radical action plan. The Mayor's Fund will ultimately operate as a Community Foundation, an independent charity which disseminates funds to local organisations through a grant process. We are very grateful to Crisis for enabling the set-up of the fund. I thank you in anticipation for joining our shared mission to end the scandal of rough sleeping which is a tragedy for those affected and an affront to the decent values of the people of Greater Manchester. Andy Burnham. I ask you to walk the streets this 6th day of Christmas and act in your job role to re open our hostels , give shelter to those who are just surviving and reportedly dying. I am a proud Manc of 70 years, I had the unfortunate realisation that there are too many homeless, living on the streets of my beloved Manchester, I only walked from Piccadilly station to the Arndale on my way to visiting my son, I must have passed at least 20 homeless/beggars, this breaks my heart to see, not only for the homeless people, but for the visitors to Manchester, I have been fortunate to have travelled extensively and this does not appear to be an issue in other countries. Surely there is an answer to this problem? I don't normally like to come on people's campaigns and do this, but I am really in need to help children in hospitals. Please help spread the word and donate! Olive branch, Edgeley Stockport. Need help. It is a drop in and food bank. The volunteers help the homeless and people in need. There is a flat above it and it needs sound proofing and cannot afford to have it done as they put people first please can you help them . The homeless uses the toilets to have a wash, shave,change clothes,use washing machine and a bite to eat. I go in to the drop in for a coffee and a chat ( my safe haven ) please help them. A total of 7.68% + 24p per donation goes to the platform (5%) and the payment processing (2.68%). Shockingly VAT is charged. How can that be right? But all platforms have overheads. This is a worthy cause. How much of the money donated is paid to the fundraising website Go Fund Me? Not sure how this connects with or supersedes the BigChange initiative which a lot of us have been supporting to now... Can someone explain? Will the two initiatives combine? First, I would like to thank you for listening to my story, and for considering helping me raise the funds I need to attend college. I have worked hard and am excited more than I can say that I have been accepted to Indiana university of Pennsylvania, my dream school. I hope you will consider helping me raise the funds to attend. My aspirations are to become a mental health technician, and eventually, I want to work in facilities helping people that are struggling with mental health illnesses as i do myself. When I learned I had gotten accepted into IUP and indeed had been accepted into the program of my choice, public health. I was both excited and proud. I am going to be the first in my family to attend college. I knew how important this would be to my mother, who sacrificed everything to give me the best possible chance of reaching success. I knew that so many opportunities would open up if I attended this university. I would be given the opportunity for better jobs, better connections, and an extraordinary chance to build a successful life in order to take care of my family. IUP has everything that I have dreamed of for a university for me. It is a perfect size and in an amazing location. Their programs are amazing, and the endless opportunities for research excite me! The campus, the community, and the class structure are perfect for me. I felt that I belonged here. And then my dream disappeared as quickly as it came. When I received the financial aid package, I noticed immediately something was wrong. I did not receive anything close to the financial aid everyone expected that I would receive given that Mom had no ability to contribute. Unless I am able to raise at least 8,000 I will not be able to attend IUP. But if I can raise enough money to get through this upcoming school year, I am confident that I will able to get more scholarship money and earn enough on my own to make it through in the next three years. Thank you for taking the time to learn more about me, and for considering investing in my future. I appreciate it more than I can say. Donation from ollie and fred. Money raised from sales of the lomax bee striped scarf.